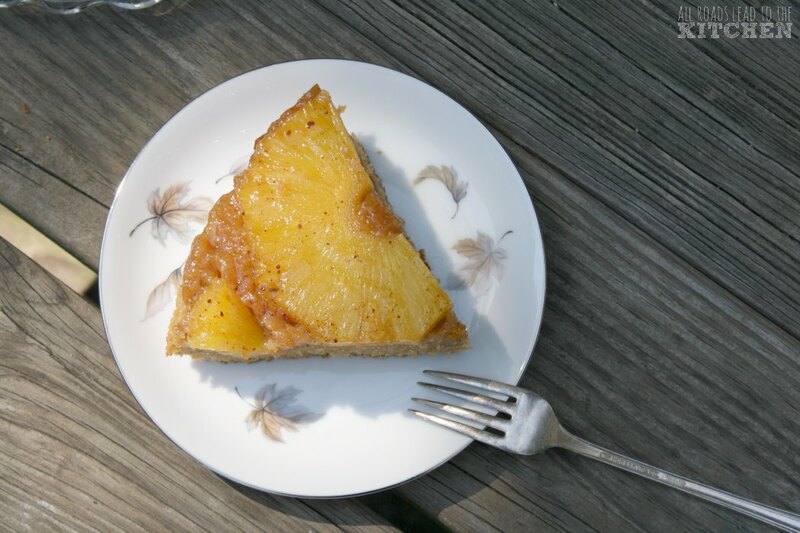 Do you remember me telling you that I would share my Pineapple Garlic Upside Down Cake with you one of these days? Well...this is a Pineapple Upside Down Cake, of sorts...but it isn't that day. What's that I sense? Relief? I understand. But we'll talk about that when the day is right. Now imagine that in cake form. That's what this is. If you're a fan of pineapple, you might also want to check out this Pineapple-Ginger Elixir recipe, this Grilled Pineapple Whisky Smash cocktail, these Pineapple Tarts, and this Ambrosia Salad with fresh pineapple! 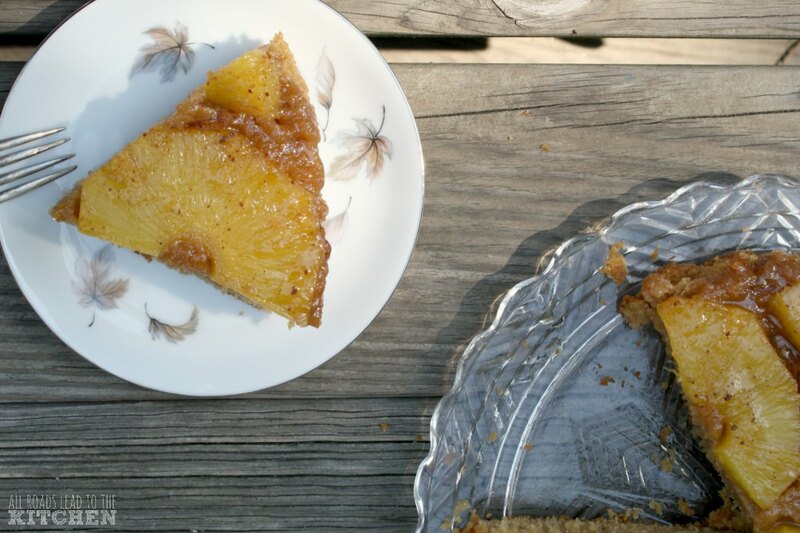 Let the infusion of warming spices seduce you with each and every bite of this pineapple upside down cake. Preheat oven to 400° F. Line a 9 1/2" springform cake pan with foil to cover the bottom and sides. Place everything in a spice grinder and grind to a coarse powder. Set aside. This should yield 2 teaspoons. Put clementine juice, butter, and sugar in a small pan with 1/2 teaspoon of the spice mixture; bring to a boil. Decrease heat and simmer for 8-10 minutes, until a thick caramel syrup is formed. It will smell like you've been transported to heaven. Just sayin'. Peel and core the pineapple. Cut into 1/4" slices. Leave whole or cut into smaller pieces and fit the pineapple pieces into the bottom of the lined pan in a single layer. Beat the butter until light and fluffy and then beat in the sugar for a bit longer. Beat in the eggs one at a time, then sift the flour and baking powder in; beat to combine. Carefully add the milk in a thin stream and beat until uniform. Add the final 1 1/2 teaspoons of the spice mixture and mix until just combined. 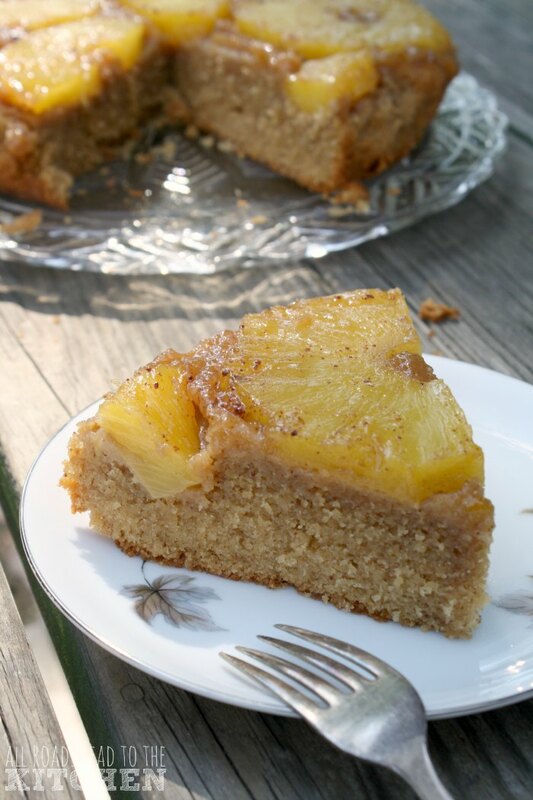 Pour the heavenly syrup over the pineapple in the cake pan, making sure it covers pretty evenly. Spoon the cake batter (it will be thick) over everything and smooth out the top. Bake for 10 minutes, then decrease the oven temperature to 350° F. and continue baking for an hour and ten minutes longer (1 hour 20 minutes total), covering with foil after the first hour. The cake will be very golden and pass the toothpick test. Remove from oven and let cool slightly before turning out onto a serving plate. Move the bottom of the cake pan and peel away the foil. I like it best warm, and it's awesome with slightly sweetened whipped cream or vanilla ice cream. ©All Roads Lead to the Kitchen. Lightly adapted from Falling Cloudberries by Tessa Kiros.